Decidual shell (falling shell) shell, formed from cells in the stroma of the mucous membrane of the uterus during pregnancy and disappearing after childbirth (separated from the uterine cavity with lahiyy). Decidual shell consists of a large light of cells that contain glycogen,the so - called decidual cells. 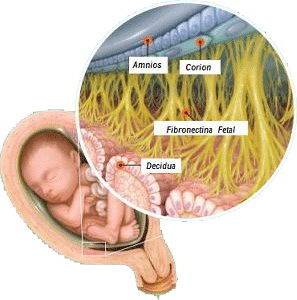 Decidual shell facilitates attachment of a fertilized egg in the uterus and proper development of the fetus. Glycogen decidual shell is used to supply eggs in the early development of the ovum.